and Promoter of the Cause of Beatification of Luisa Piccarreta. First and foremost the members of this Association must understand that this is God’s work, not ours, and littleness on the part of each member is indispensable to this work. Luisa. It is important to maintain a spirit of humility, in which each one feels smaller than the other, or rather, maintains a sense of nothingness before God and the creatures. The key to live this associative life is faith, pure, stable, disinterested, which leads to the possession of God; the humility which brings the awareness of our nothingness before God and before man. 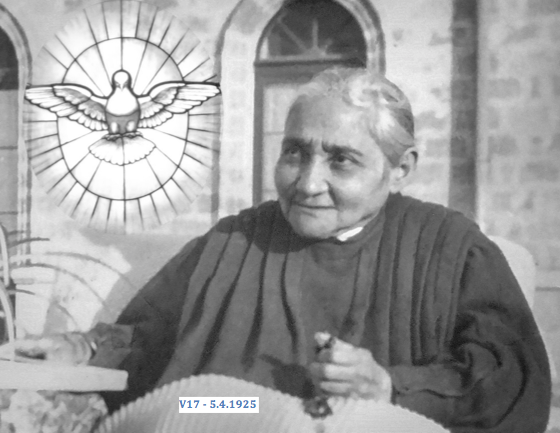 The model to imitate is our older sister Luisa Piccarreta, God’s chosen one, chosen precisely for her smallness, to be messenger and bearer of the Gift of the Divine Will. Luisa will guide and sustain us as we walk in the Divine Fiat. We must always keep in mind that this is Luisa’s Work; this is her Association, therefore it will walk in the shadow of her soul, small and hidden, a simple creature in customs and culture. The Association will grow only in Luisa’s wake with a gradual development depending entirely on the willingness of each member and their personal level of humility. In front of God, the HolyChurch and the Association, we have the obligation of dedicating ourselves with all our strength to follow Luisa, witnessing and living in her spirituality and not falling into the practice of devotion. This Associative family is based upon the foundation of a great spirituality: the Divine Will. It is an Association which invites souls with varying degrees of age, spiritual maturity, cultures and personalities, including one’s problems, weaknesses and limitations produced by the human will. We are inspired by the Divine Will to look at our life under It’s Light, and begin a gradual growth towards conversion and perfection. Empty from your life and from the associative life you have with the Association every prejudice, because it is this that creates problems and discord. We should accept everything as from God’s hands because everything He does is for the good of our souls. Those who work with constant commitment and sincerity of heart acquire a spirit of joyful charity and submission which, together with humility, form that vacuum within oneself, allowing God to fill it with His Sanctity: this means letting the Divine Will reign. To this gradual accumulation of knowledge we arrive at the reason for our Association. We exist to live in the Divine Will and divulge the knowledge of it. If we do not live what we intend to give to others, we lack the substance of our spiritual lives, and our jobs and our apostolate will be without fruit. The Writings of Luisa should be for us our daily nourishment, second only to the Word of God. That is why it is so necessary to commit ourselves to know and understand it. The Kingdom of the Divine Will cannot be complete on earth without a growing spiritual association in the knowledge and the diffusion, ordered and compact, of the writings of Luisa. Only knowledge leads to possession. – To be disposed and opened more and more to the Light that transmits this great Gift of God, remaining always aware of our nothingness. of Heaven; and this, also being on earth, by growing in the Light of the Divine Will. The Association must be in a constant “re-birth” of spirit. In this family there is no room for ourselves, but only an intense interest in God’s Kingdom and the triumph of His Most Holy ruling on earth as it is in heaven. It is absolutely necessary that we put ourselves on the road to obedience, and let ourselves be guided by the Will of God. And this can be assured to us only by means of a priest. It is only with priestly guidance that we can bring about union with God and with our neighbor, union of the human will with the Divine, and create with Him constant communication. unity in God by fighting the division which the enemy seeks to create. submission to the priest who assisted her daily. Stay close to your personal spiritual director, and live in peace with your neighbor. Those who have opened their hearts to this Gift, kept by God in spite of human ingratitude, just need to cherish the desire of living it. Our miseries and limitations must not suffocate the so many graces the Lord wants to give. The darkness of our human will must not obscure the Light emanated by the Divine Will, and cannot stop the course of our self-offering. -To remain in the peace of Jesus Christ. -To be attentive to Jesus and to His Truths in the Most Holy Divine Will. As the members of this family grow and strengthen more and more the bond with the Will of God, just as between Father and son, so they also reinforce the tight relation of charity and union of wills among themselves. This happens in a real way for those who, disinterested and in pure faith, become members of this family, holding the certainity of having found the keys of the Kingdom, the precious stone: the Divine Will as life. sweetness of the service of Jesus with the apostles and all other souls. It is a simple path made of love and charity. Love has no limits but, only the desire to please the person who inspires to love. *We must find refuge in the Immaculate Heart of our Most Holy Mother, and we ask that She nourish us with the food of the Most Holy Will of God. a soul so intimate with God resided in our very midst. exalted to the honor of the altar as, without any shadow of doubt, she deserves. see that it is a wine in which I greatly delight. holiness in your days of friendship and rejoicing.